HONOLULU (AP) — Seven researchers have been evacuated from a remote atoll in the Northwestern Hawaiian Islands as a powerful hurricane headed their way, officials said Wednesday. A research vessel picked up the seven from French Frigate Shoals, said Kate Toniolo, the acting superintendent of the Papahanaumokuakea Marine National Monument. The atoll is about 500 miles (800 kilometers) northwest of Honolulu. Hurricane Walaka was south of the island on Wednesday and heading north with maximum sustained winds of 130 mph (210 mph). On Monday the Coast Guard evacuated four workers from a national wildlife refuge on Johnston Atoll before Walaka passed that island. The storm hasn’t threatened Hawaii’s most populated islands, where the state’s 1.4 million people live. The French Frigate Shoals researchers were studying and monitoring Hawaiian monk seals and Hawaiian green sea turtles, Toniolo said. They were due to leave the island in the middle of this month, so the evacuation accelerated their departure, she said. Amanda Dillon, scientific content coordinator for the National Oceanic and Atmospheric Administration, said the research vessel picked up the team on Sunday after being diverted from a project near Kauai. The ship returned to Honolulu on Tuesday. French Frigate Shoals is where 95 percent of Hawaiian green sea turtles — classified as threatened under the Endangered Species Act — nest. The turtles dig holes on the beach and lay their eggs in the sand, so there’s a possibility a storm surge from the hurricane may wipe out their nests. Storm surges may also hit Hawaiian monk seals that rest on the shoreline with their pups. The seals are an endangered species. Toniolo said researchers won’t return to the island until next year. But a crew collecting marine debris in the marine monument will likely be able to stop by and check for damage before then. Laura Beauregard of the U.S. Fish and Wildlife Service said the hurricane poses similar concerns for Johnston Atoll, which is about 825 miles (1,300 kilometers) southwest of Honolulu. Johnston is the lone nesting spot for tens of thousands of seabirds within 450,000 square miles (1.1 million square kilometers), she said. Some birds have ability to sense air pressure changes as a storm nears and can leave, but they may also be thrown off course, Beauregard said. “But most of them are very tenacious parents, and they’re going to stay to protect their chicks,” she said. Falling trees and flying debris could kill the birds. Birds that nest in burrows could drown. Scientists won’t be able to check on the seabirds and the island until another crew heads to the atoll in December, she said. The U.S. Fish and Wildlife Service sends small crews to the island on six-month rotations. The evacuation cut short the current rotation by a couple of months. Officials initially thought the workers, who included one staffer and three volunteers, could ride out the storm. 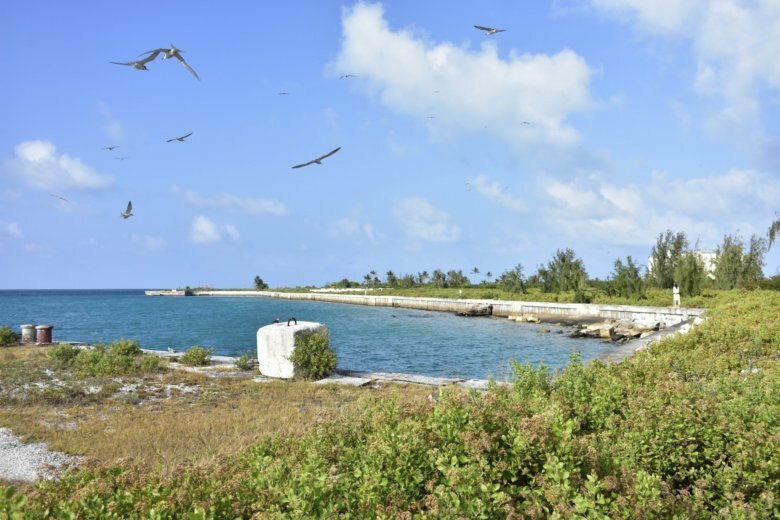 The atoll has a four-story concrete structure dating to the days when it was used by the Navy that the workers could seek shelter in. But the building is only designed to withstand a Category 4 hurricane and for a while Walaka was a Category 5 storm. “At that point, we knew it would be prudent to have the crew evacuated off the island,” Beauregard said. This story corrects the first name of a NOAA official to Amanda.